The Department of Education will continue to implement School-Based Feeding Program (SBFP) nationwide in accordance with the General Appropriations Act (GAA) for the current year and will cover all identified target beneficiaries. The program upholds its objectives in the improvement of classroom attendance of target beneficiaries to more than 85% per year, and encourage learners to go to school every day. The priority target beneficiaries for School-Based Feeding Program (SBFP) shall be all undernourished (SW/W) Kinder to Grade 6, and all Kinder in selected Philippine Plan of Action for Nutrition (PPAN) areas with prevalence of stunting. Actual target beneficiaries shall be based on the Baseline (June-July) nutritional assessment of the current school year. Health and Nutrition is integral to the total development of the child: physically, mentally, emotionally and spiritually. Studies showed that undernourished children perform poorly in class. Ideally, health and education should have a symbiotic relationship, if only to get the full benefit of education. DepED is seeking to attain the Millennium Development Goal (MDG) No. 1, Target No. 2 which will eradicate poverty and hunger, and reduce malnutrition to 50% by the year 2015. The DepED is in full agreement with the MDG especially if it concerns improving the quality of basic education. The Development and Standardization of Recipes Using Malunggay is a breakthrough in School Nutrition Program. It simply involves the creative transformation of school garden yields into nutrient-rich meals and drinks for supplemental feeding purposes. With the school and community working as one, we believe the improvements in the learners’ nutritional health, school attendance, class participation and completion will eventually achieved. I commend DepED’s Health and Nutrition Center, the regional nutritionist-dietitians, the contributors, writers and consultants in coming up with this pioneering recipe book. The magnitude of malnutrition among public elementary and secondary schools is alarming. Reports from the field revealed a fluctuating trend on the prevalence rate of undernutrition. We are aware that poor nutrition affects the academic performance of learners. 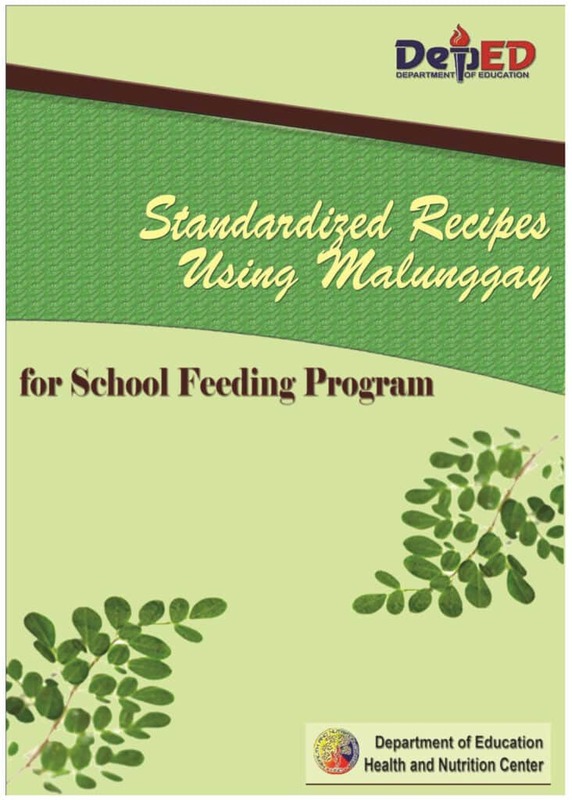 The Development of a Recipe Book using Malunggay is indeed another milestone in the School Nutrition Program. It is very timely and relevant that we focus on providing all comprehensive health and nutrition package to food poor areas of the country and to identify Low Performing Schools in order to turn-around the academic performance of the schools. 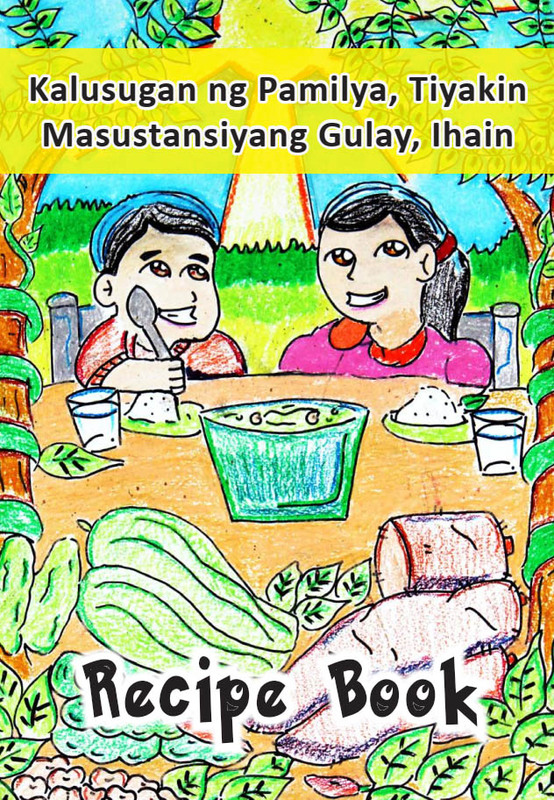 This book is useful to home economics teachers, canteen managers, feeding coordinators and parents in the preparation of recipes using malunggay for supplementary feeding in schools and in their homes. I wish to express my sincerest gratitude to the Health and Nutrition Center for facilitating the development of a recipe book using malunggay. 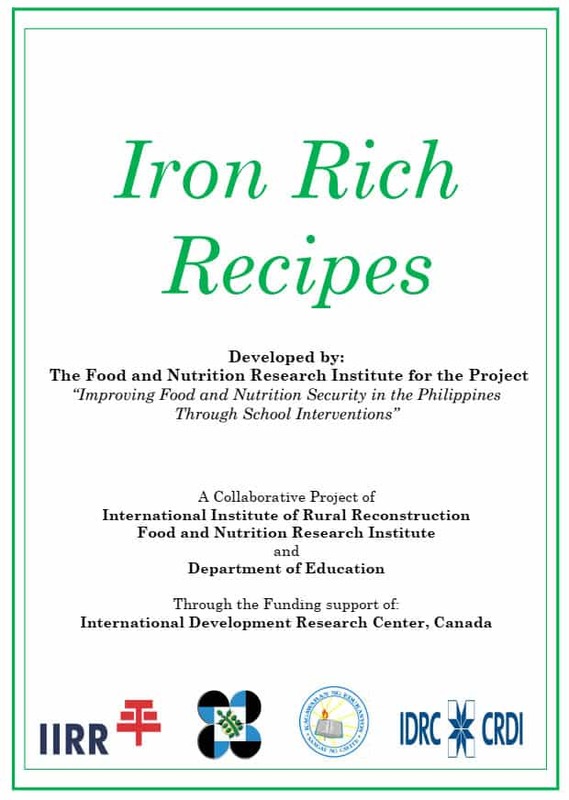 Likewise, my deepest thanks to all DepED nutritionist-dietitians for their dedication and commitment in the preparation of recipes, to the staff of FNRI for their technical assistance, and to the writers, contributors and consultants for their invaluable inputs to this endeavor. Ang kalusugan ng bata ay nakadepende sa maraming bagay. Isa na rito ay ang kalidad ng pagkain. Mahalagang pangalagaan ang kapakanang pangnutrisyon ng mga bata dahil ito ay nakakaapekto sa kalidad ng pamumuhay nila. Ang batang nakakakain ng tama ay malusog kaya nagiging matibay laban sa sakit at mas nakakapag-aral nang mabuti. Ang pagkain ang nagbibigay lakas, tumutulong sa paglaki ng buto at kalamnan, at nagbibigay ng bitamina at mineral na siyang nangangasiwa sa buong katawan. Kung maaari, maghain tayo palagi ng mga pagkain na galing sa sariwang gulay o karne dahil mas masustansiya ang mga ito kaysa sa mga pagkaing naproseso o nakalagay sa plastic o lata. Ang recipe booklet na ito ay naglalaman ng mga paraan ng pagluluto ng mga katutubong gulay na masustansiya at madaling itanim. Ang pagtatanim ng gulay ay nagbibigay sa atin ng kasiguruhan na may mapagkukunan tayo sa anumang oras na ito’y kailangan. In the Philippines, malnutrition continues to impact on health, growth and development of young children. The recent 2015 National Nutrition Survey data revealed that the prevalence of underweight among 5-10 year old Filipino children is 31.2% while stunting is 31.1%. Micronutrient deficiencies like iron and vitamin A deficiencies are also widespread. The Food and Nutrition Research Institute of the Department of Science and Technology (FNRI-DOST), in collaboration with the International Institute of Rural Reconstruction (IIRR) and the Department of Education (DepEd) Division of Cavite developed an integrated nutrition model, GarNESupp, a three pronged approach towards addressing under nutrition among schoolchildren through gardening, supplementary feeding and nutrition education. It is envisioned to help in reducing school age malnutrition and promote utilization of local vegetables in school as well as at home. This work of FNRI on menu-cycle development offers solution to the problem of malnutrition and fulfills the school gardening and feeding links. We urge the feeding center teachers, as well as the parents to prepare these nutritious and tasty dishes that aim to promote better nutrition of our schoolchildren. The partnership with Food and Nutrition Research Institute-Department of Science and Technology (FNRI-DOST) allowed International Institute of Rural Reconstruction (IIRR) to move its objective of ensuring utilization of indigenous vegetables planted in the school garden. We have been successful in influencing institutionalization of school gardens in the 1980s and enhanced them through the practice of Bio-intensive gardening, popularly called as BIG. However, we know that access and production of vegetables alone are not enough. These have to be utilized not only in schools but also in homes where parents can prepare vegetable dishes for their families, especially their children, in a more appetizing and attractive way. GarNESupp is an integrated approach of gardening, nutrition education and supplementary feeding. It is envisioned to help in reducing school age malnutrition and promotes utilization of local vegetables in school as well as at home. This work of FNRI on menu-cycle development offers solution and fulfils the school gardening and feeding links. We urge the feeding center teachers, as well as the parents to prepare these nutritious and tasty dishes that aim to promote better nutrition of our school children. You will truly love this book! Make it as a partner as you take care of your students and children. The latest consolidated report on the nutritional status of elementary schoolchildren in the Philippines reveals that out of the 9,640,558 pupils weighed, there are 121,227 severely malnourished children. The report suggests that the schoolchildren may not have been sufficiently fed, the children may not have chosen/eaten the right food for their age or, their parents could have cared less. This book, “Standardized Recipes Using Indigenous Foods for the School Nutrition Program” will serve as a handy reference to the parents and school feeding coordinators in the preparation of nutritious snacks/meals for the schoolchildren. This is aimed to improve the nutritional health of the children, thus will ultimately uplift their academic performance. I would like to commend the staff of the Nutrition Division of the Health and Nutrition Center for initiating the development of a recipe book of standardized recipes utilizing indigenous foods. This is indeed a miles stone in the School Nutrition Program because the recipe book shall serve as a ready reference/guide in the preparation of nutritious foods for our school children. I am fully aware how tedious the process had been – from formulation of the recipes, to testing; then computing caloric content and validation. The office is deeply grateful to the selfless efforts and commitment of the DESC’ Nutritionist-Dietitians who painstakingly prepared to recipes; and to the staff of the Food and Nutrition Research Institute for their technical assistance and expertise.